Abstract. An inverse error variance weighting of the anomalies of three terrestrial evaporation (ET) products from the WACMOS-ET project based on FLUXNET sites is presented. The three ET models were run daily and at a resolution of 25km for 2002–2007, and based on common input data when possible. 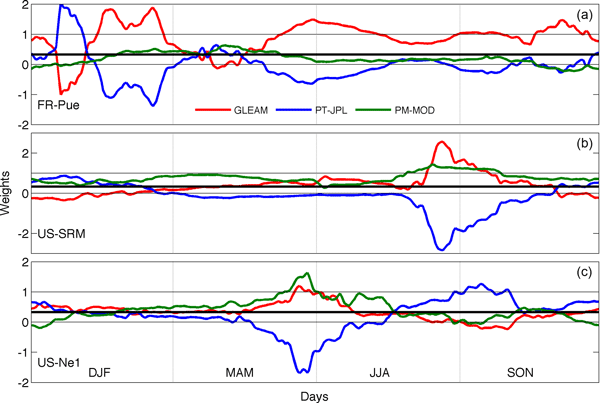 The local weights, derived based on the variance of the difference between the tower ET anomalies and the modelled ET anomalies, were made dynamic by estimating them using a 61-day running window centred on each day. These were then extrapolated from the tower locations to the global landscape by regressing them on the main model inputs and derived ET using a neural network. Over the stations, the weighted scheme usefully decreased the random error component, and the weighted ET correlated better with the tower data than a simple average. 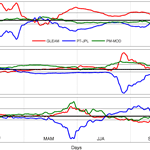 The global extrapolation produced weights displaying strong seasonal and geographical patterns, which translated into spatiotemporal differences between the ET weighted and simple average ET products. However, the uncertainty of the weights after the extrapolation remained large. Out-sample prediction tests showed that the tower data set, mostly located at temperate regions, had limitations with respect to the representation of different biome and climate conditions. Therefore, even if the local weighting was successful, the extrapolation to a global scale remains problematic, showing a limited added value over the simple average. Overall, this study suggests that merging tower observations and ET products at the timescales and spatial scales of this study is complicated by the tower spatial representativeness, the products' coarse spatial resolution, the nature of the error in both towers and gridded data sets, and how all these factors impact the weights extrapolation from the tower locations to the global landscape. How to cite: Jiménez, C., Martens, B., Miralles, D. M., Fisher, J. B., Beck, H. E., and Fernández-Prieto, D.: Exploring the merging of the global land evaporation WACMOS-ET products based on local tower measurements, Hydrol. Earth Syst. Sci., 22, 4513-4533, https://doi.org/10.5194/hess-22-4513-2018, 2018.